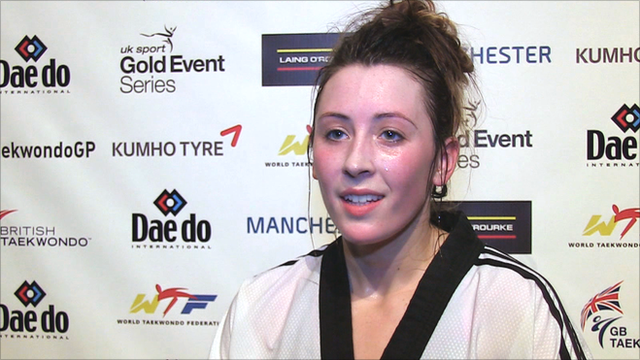 United Kingdom - 2014/10/27 - World number two Jade Jones bemoaned another defeat to long-time rival Eva Calvo Gomez after losing on a golden point in the final of -57kg category at Manchester's World Taekwondo Grand Prix. Calvo Gomez secured her third straight grand prix victory, having won the first two of the year in China and Kazakhstan, defeating Jones in overtime after a 4-4 draw over three round. The Brit had earlier romped into the final, beating Japan’s Mayu Hamada in the semi-final 12-0, but was unable to pick her way past the tall figure of the world number one. “She’s a really good player, but I’m getting better and better,” said a frustrated Jones. “I keep making the same mistakes. She’s got long leg length and I like to stand and fight at a distance, so it makes it easy for her to kick me without me getting a shot back in” said Jones. The partisan Manchester crowd roared every Jones kick and punch but her Spanish opponent, who edged past Ah-Reum Lee in her semi-final, secured yet another gold medal. “I’m very pleased because I knew it was going to be a very hard fight against Jade, it always is,” said the 23-year-old. “She’s a really great fighter and I’m really happy to have won”, said Calvo. “Every championship against Jade it’s always a really hard match, usually a golden point. She’s so explosive and she’s physically stronger than me”. “Personally I like the golden point because I only ever fight one point at a time”. Jones’ performances even drew plaudits from Chung-won Choue, president of the World Taekwondo Federation. “Jade is very good and she’s still young, so she could even win another Olympic gold medal in the Rio games,” said the South Korean.